The 2D-SPM registration fee does not include accommodation. However, there are a number of vacancies blocked in a couple of residences from 24th to 29th June. Participants can make their own bookings separately when they register for the conference. On the registration platform (once it is available) they will be able to reserve their own accommodation. Please note that vacancies at Villa Alaidi are in shared rooms of two, three beds (here you buy beds, not rooms) except for 5 single rooms that are also available. *Prices include breakfast and VAT. Donostia offers a great variety of different kinds of accommodation, ranging from 5-star hotels to hostels and flats. In order to make it easier for you to find the accommodation that better suits you, we suggest that you visit the link of the Tourism Office, below. You can make your own reservation directly at the selected place. 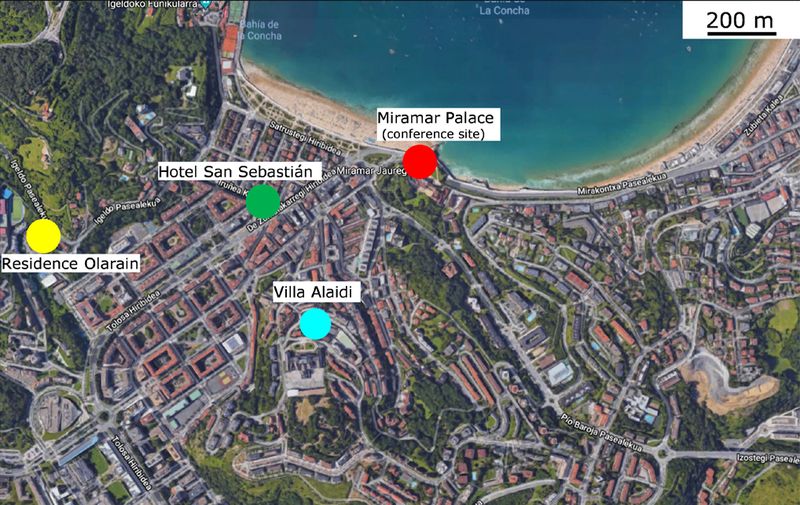 Please find below a map with the location of the hotels as well as the location of the conference site (Miramar Palace). All hotels are a 10-20 minutes walk from the Palace.